I've had quite a few requests about making a bundle pack with craft templates for the Spring. My Winter templates pack was a success so I decided to go ahead and make the same thing for Spring and Summer! I included 6 of my Spring/Summer crafts! I also decided that it would be nice for everyone to have different choices in my store so I created a HOLIDAYS Craftivity pack and a pack for the WHOLE YEAR! My holidays pack contains 9 of my craftivities for the holidays throughout the year! 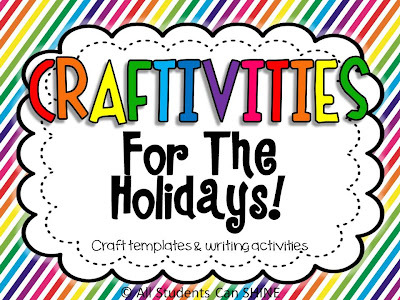 Each craftivity comes with a bunch of fun writing activities too! **If you want more information, you can go to my TPT store to check out the preview! 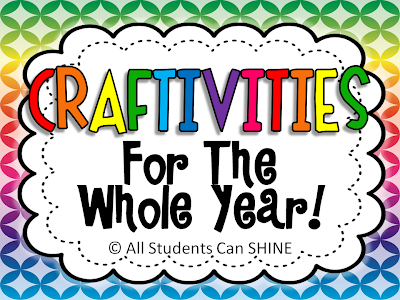 My Craftivities For The Whole Year pack is jam-packed with 25 craft templates! This pack has TEMPLATES ONLY. 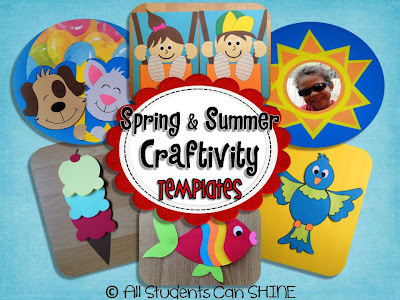 This item is perfect if you teach young learners who are not yet writing (pre-school) OR if you are an art teacher and do not need the writing activities that go with my crafts. It is the purchase that keeps on growing! Every time I add a craftivity to my store, this item will be updated with the new templates. There are currently 25 craftivities in this pack!! Wow! This is great! Thanks for all the hard work!